If Sen. Bernie Sanders sounds like a broken record, that’s fine by him. In fact, he says, serving as a veritable one-man message machine is a yuuuge part of his job. But there’s a reason for the repetition, he says: The poor, the working class, the sick and the elderly are being left behind, while wealthy individuals and corporations are taking larger and larger slices of the economic pie. If ubiquity is the Vermont independent’s goal, then he’s certainly succeeding. Rarely does a news cycle pass without Bernie’s mug appearing on MSNBC in a live shot from the Capitol. Each performance is the same as the last: Sanders grimaces — trying to look friendly, but usually looking bored — until the anchor shuts up long enough for him to rattle off a slew of facts and figures backing up his claims of growing economic inequality. Sanders’ omnipresence is even more complete in the social-media realm. Only five senators — most of whom have run for president or are planning to — have more Facebook followers than Sanders’ nearly 208,000, according to social-media tracker OhMyGov. And only three — Sens. John McCain (R-AZ), Marco Rubio (R-FL) and Rand Paul (R-KY) — have more Twitter followers than his 151,000. “I’m trying to raise a voice above the mass media,” the senator explains. All that exposure has been good for Sanders’ political bottom line. During his last reelection effort — a drubbing last November of Republican John MacGovern — Sanders managed to raise $6.2 million in 146,460 mostly small-dollar contributions from a nationwide network of donors. Now, two months into his second term, Sanders appears to be relishing his steady rise in seniority — he ranks 47th in the 100-member body — and a new assignment that came with it: chairmanship of the Senate Committee on Veterans Affairs. It’s the first time in his 22 years in Congress that he’s been tasked with running a full committee. “I realize it’s a very, very time-consuming job. It’s something I’m excited about,” Sanders said in a subdued voice, sitting on a couch in his Dirksen Senate Office Building suite. Sanders’ top priority on the committee is to clear a claims backlog in the Department of Veterans Affairs stemming from a dozen years of war and recent federal recognition of Agent Orange exposure in Vietnam-era vets. Nearly 900,000 veterans are waiting for their claims to be processed, while 70 percent of claims have been pending for more than 125 days, according to the VA.
“The good news is that they are now processing about a million a year, which is far more than they used to. The bad news is, they’ve got a big backlog,” he says. Lest you think Sanders’ new job has distracted him from his monomaniacal focus on economic justice, it has not. Rather, Sanders is using his new bully pulpit to joust with the same old windmills. Case in point? A proposal embraced by the White House and other Washington centrists to change the formula used to calculate Social Security cost-of-living adjustments. While deficit hawks argue that the so-called “chained CPI” is necessary to reduce the growth of entitlement spending, progressives say it’ll simply screw the elderly. In the past month, Sanders has cannily used his committee dais to hammer home the point that a chained CPI would also hit 3.2 million disabled veterans and 350,000 survivors. And he’s enlisted the help of seemingly conservative allies — including the leaders of veterans groups — to make his progressive case. Sanders’ relationship with Washington Democrats remains fraught. Though he argued in favor of a primary challenge to President Barack Obama in July 2011, he campaigned for the president’s reelection in New Hampshire last fall. “I’m disappointed but not surprised,” Sanders says of the first few months of Obama’s second term, citing agreement with the president on gay rights and immigration issues and disagreement on economic policy. Likewise, Sanders is quick to criticize congressional Democrats, though he continues to caucus with the party’s Senate majority. Sanders appears chagrined that in the National Journal’s annual ideological rankings of the Senate, he clocked in as the 32nd most liberal member of the body — ostensibly to the right of Vermont’s other Senate delegate, Democrat Patrick Leahy, who came in at 24. But that’s not the whole story. Despite his bellicose rhetoric, Sanders tends to vote in favor of major Democratic initiatives — from health care reform to the last-minute New Year’s Day deal to avert the fiscal cliff — only to rail against their shortcomings later. Sanders’ loquaciousness has its limits. When the conversation shifts away from bread-and-butter economic issues, his answers become curt. On the issue of gun violence, he is particularly tight-lipped. Indeed, he refused to grant an interview to Seven Days on the subject for two and a half months after last December’s deadly school shooting in Newtown, Conn.
That could be because Sanders — who first won election to the U.S. House when the National Rifle Association targeted his Republican opponent — has largely opposed federal firearm laws, calling gun control an issue for states to decide. His position seemed to shift in January, when he intimated in a written statement that he’d support federal bans on assault weapons and high-capacity clips proposed by Obama. “What about high-capacity ammunition?” Seven Days asked. “That is something we’re looking at as well,” he said. Five minutes after the gun discussion had begun, Johnny One-Note wanted to get back to tax policy and economic disparity. Back in Burlington five days later, Sanders was in similar form. After calling a press conference at his Church Street district office, Sanders told a group of four television reporters, one online reporter and one print reporter precisely what they didn’t want to hear. 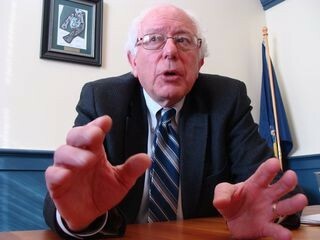 Sitting between two social service agency directors, Sanders passionately decried the effect the $1.5 billion budget sequester would have on Vermont’s poor and working class. “Passionately” meaning, in this case, that he was red-faced and practically shouting halfway through his remarks. Asked later in the press conference what he thought about Sen. Paul’s 13-hour filibuster last week, Sanders sounded unimpressed — even though it outlasted Sanders’ own 8.5-hour diatribe in December 2011 against tax breaks for the wealthy. “Obviously I disagree with Sen. Paul. He’s an extraordinarily conservative guy,” the Vermont independent said, before quickly segueing to the need for filibuster reform. Paul’s speech, of course, focused on his hyperbolic concern that the Obama administration might be willing to kill American terrorism suspects in domestic drone strikes, as it has abroad. Sanders himself cited the administration’s drone program in his justification last Thursday for changing his mind at the last minute and opposing Obama’s CIA director nominee. Asked to clarify whether he disagreed with the Kentucky senator, Sanders said, “Yeah, Sen. Paul is — well, he spoke for 12 hours. I’m not going to go into everything—” before turning to WCAX’s Keith McGilvery for another question on the topic at hand. After Johnny One-Note left the room, Seven Days asked Dan McLean — Sanders’ Vermont press secretary and a former Burlington Free Press reporter — why the senator wouldn’t answer such a basic, inoffensive question. “I think he wanted to talk about what he wanted to talk about,” MacLean explained. Mirror, mirror, on the wall?